As we noted in a post over the weekend, the "sell in May" seasonality phenomenon obviously enjoys a lot of press at this time of the year. As the below chart shows, the May to October period tends to be a flat to slightly up period for the equity market. Investors should ask themselves if selling out of stocks in May risks them not being in the market when the seasonally strong period begins in November. In other words, will investors implement the appropriate timing trade to re-enter the market. The second chart below is from the blog of the Stock Trader's Almanac and shows the 6th year of a presidential term tends to be a strong one. Granted, the data set of six year terms is not a large one. Following is Chart of the Day's commentary on this seasonal technical indicator. "The stock market is about to enter what has historically been the weakest half of the year. Today's chart illustrates that investing in the S&P 500 during the six months of November through and including April accounted for the vast majority of S&P 500 gains since 1950 (see blue line). 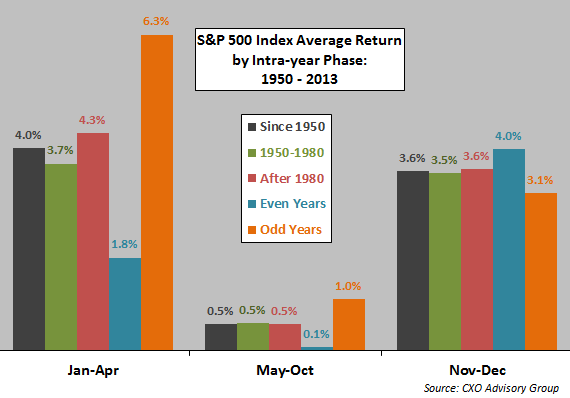 While the May through October period has seen mild gains during major bull markets (i.e. 1950-56 & 1982-97), the overall subpar performance during the months of May through October is noteworthy. Hence the saying, 'sell in May and walk away.'" Last week a number of important economic variables were released with mixed outcomes. The mixed economic reports are reflective of a still slow growth economy. In spite of historically low interest rates, the housing sector is not showing strong signs of growth. Existing home sales fell .2% and they are down 7.5% on a year to date basis. New homes sales data was even worse as they fell 14.5% in March. In the manufacturing sector, durable goods orders spiked 2.6%. Even excluding transportation durable goods climbed 2.0%. Excluding transportation segments, all major components were positive. Leading Indicators exceeded expectations and rose .8%. One positive contributor to the leading indicators was the contribution from a gain in factory average weekly hours. A comprehensive review of last week's reports can be found at Econoday's economic calendar. The coming week also contains potentially market moving economic data, GDP (W), jobless claims (Th) and the employment situation report (F). This week also contains a two day FOMC Meeting with the announcement occurring at 2:00pm on Wednesday. Other topics of potential interest can be found in the Week Ahead Magazine link below. Often times the difficult aspect of writing blog commentary is posting articles that are interesting to investors and, more importantly, not a repeat of the commentary written by others. At times some of the same topics are repeated on the web during a given week where each article provides no new insight to readers. The repeating of similar topics begins to give investors the sense that a consensus view is developing. And one factor we know about the market is it likes to prove the consensus wrong. A good example of this fact is displayed when looking back at prognosticators' predictions at the beginning of the year. Most predictions were of the general theme that stocks would outperform bonds, but as the below chart shows, bonds have actually outperformed stocks. So what is the point? 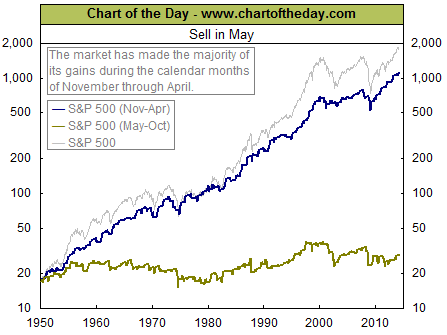 A theme currently getting a great deal of attention is the "sell in May and go away" topic. Even we have written about this seasonal market factor a number of times, as recently as mid-March. The importance of this theme is best explained by the below chart. "The seasonal slogans often substitute for thinking and analysis. 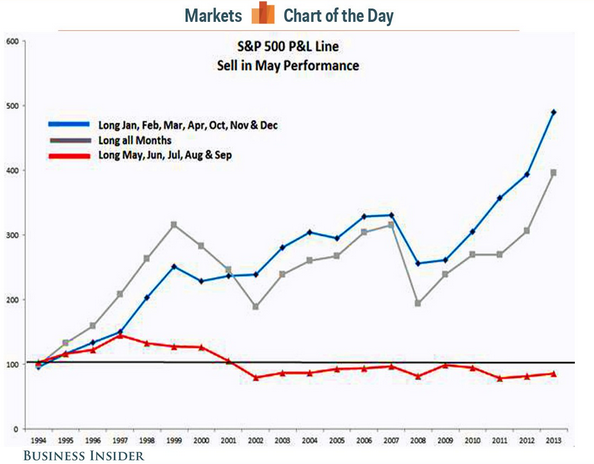 The powerful-looking chart...actually translates into a 1% monthly difference in performance. The "good months" gain 1.3% on average while the "bad months" gain about 0.3% (emphasis added). To make a wise decision you need to make an objective quantitative comparison between the economic trends and the small seasonal impact. The Great Recession has been followed by a slow and plodding recovery. We have an extended business cycle with plenty of central bank support. Since I am expecting the current cycle to feature (eventually) a period of robust growth, I do not want to miss it. The 1% seasonal effect will be minor in a month where we get a real economic surge." The next chart displays the previous chart data in a different way. In an effort to visualize Jeff Miller's comment, "...I do not want to miss it. The 1% seasonal effect will be minor in a month where we get a real economic surge," the below chart shows average returns for various time periods going back to 1950. The take away from the below chart is the fact, even as bad as the May to October period can be, on average, the returns remain positive. Another consensus discussion has been the rotation trade out of growth stocks into value stocks. 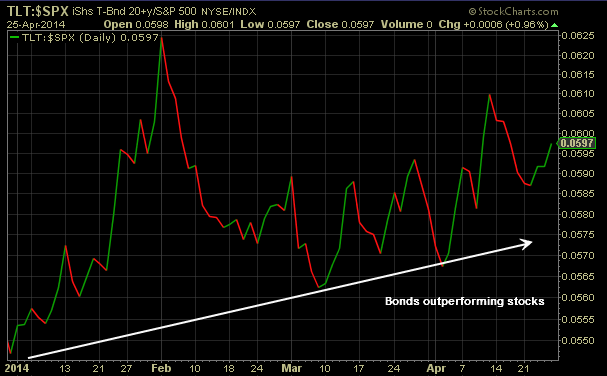 The below chart reflects the fact value has been outperforming growth since the beginning of March. Importantly for investors, why is or has this occurred. 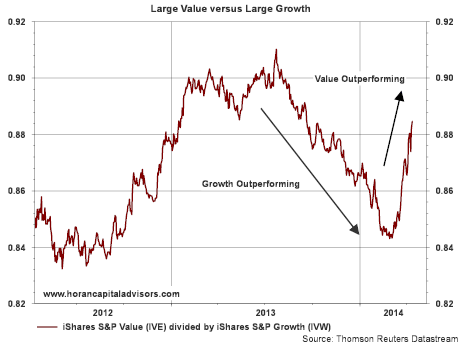 The value style tends to outperform growth late in the economic cycle. In reviewing the technical aspects of the chart, there may be reasons to believe this trade is nearing a trend reversal. As the circle at the end of the chart notes, over the course of the last few weeks value is actually struggling to outperform growth with the MACD rolling over as well. 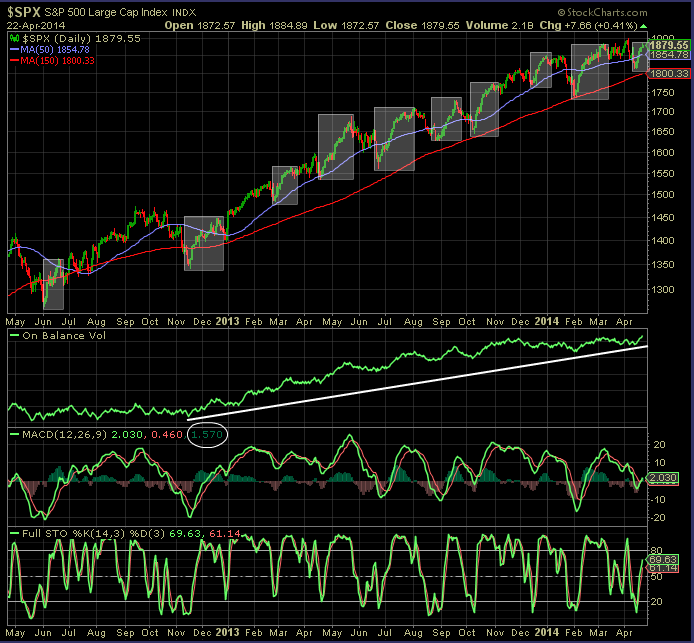 The second chart below shows the momentum index (MTUM) performance versus the broader S&P 500 Index. Is a trend reversal taking shape here too? When I read commentary like this, OUT, I am led to believe a trend change is closer to occurring than not. A discussion on the weather's impact on first quarter results also seems appropriate too. Many first quarter reports have cited weather as a factor in negatively impacting first quarter results for companies. One segment of the market that reasonably can be thought to have been negatively influenced by the weather is retail. In our blog post in mid January, Broader Implications Of A Weakening Retail Sector, the below chart was included in the post showing the significant underperformance of the retail sector from the end of November to mid January. In that post we highlighted a couple of points. "if the pervasive market sentiment is the consumer has rolled over, vis-à-vis the market and the economy, the efficient market hypothesis would imply this type of news is factored into current stock prices." "The weaknesses in some consumer stocks is certainly worth paying attention to; however, the market/investor already knows a lot about this weakness and a majority of this bad news may be factored into stock prices [emphasis added]." 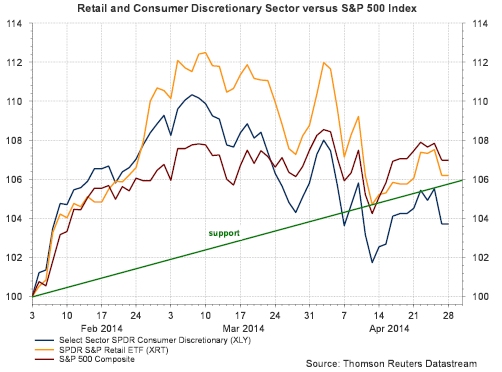 How has the retail sector performed since that January post? It has essentially tracked the market and has generated a return in excess of 6% as can be seen in the below chart. Second-quarter outlooks for S&P 500 companies so far are much more optimistic than the last two quarters. Fewer companies are cutting estimates and those that are reducing forecasts haven't done so as aggressively as in the past. "The downward revisions for the second quarter right now are very, very mild," said Nick Raich, chief executive officer of The Earnings Scout, an independent research firm specializing in earnings trends." Surprisingly strong results have come from many high-profile names, including Apple , Caterpillar , Netflix and United Technologies . That's offset what Wall Street had expected to be a lackluster first quarter. Estimates were slashed, heading into this earnings period as the unusually harsh winter hampered transportation, kept people out of stores and raised heating costs. So far, 69 percent of companies have beaten analysts' expectations, above the long-term average of 63 percent, Thomson Reuters data showed. Helping to relieve concerns, United Technologies, Coca-Cola , General Motors and McDonald's all reported strong results from their China operations. That's negated one of the market's primary worries that weak demand from the world's second-largest economy would hit profits. "It is still a little surprising how strong China remains, given what you read," United Technologies' Chief Financial Officer Greg Hayes said in an interview, in reference to the conglomerate's building systems businesses. So to rephrase Jeff Miller's comment, do not let the consensus and "...seasonal slogans substitute for thinking and analysis." Until today, when the S&P 500 Index declined .22%, the market had managed to move higher on the prior six trading days. 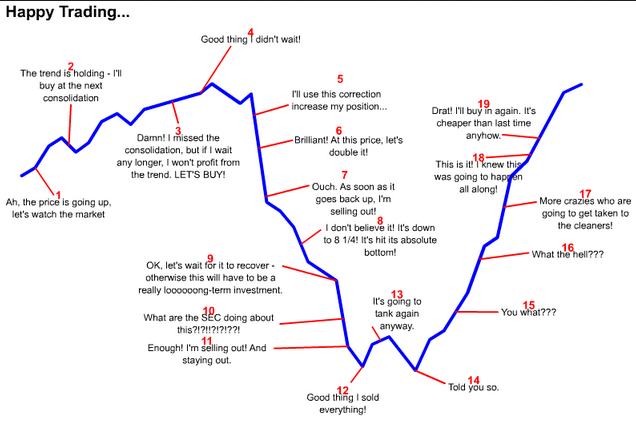 The six day climb followed what some investors thought might be a correction beginning to take place in the market. 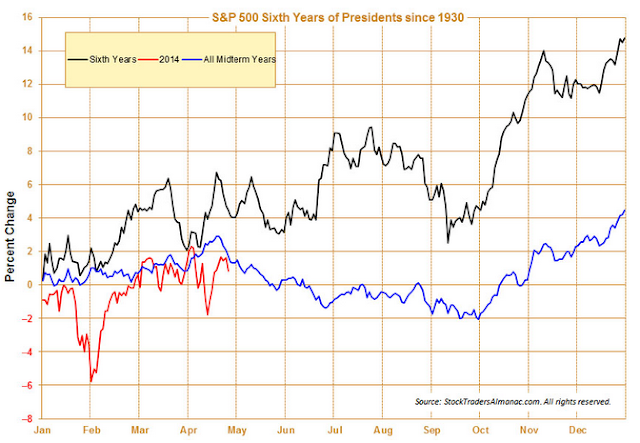 On April 2nd the S&P reached 1891 before declining 4% to 1816 on April 11th. The six subsequent trading days saw the S&P 500 Index rise 64 points to 1880, nearly recapturing the high reached on April 2nd. This type of trading action has been the norm for this market going back to mid year 2013. I prepared the below chart late last night and was motivated to post it here following a similar chart highlighted today by Charles Kirk of The Kirk Report. The red 150 day moving average line has served as an important support level for the market for the past year and a half. Charles Kirk commented, "this is also why the short-term quant data suggests new highs versus more traditional metrics." Putting Kirk's comment another way, algorithmic trading has been "programmed" to trade these patterns. Until we see a breakdown of this pattern type trading, the markets will likely move in the direction of its current longer term trend and that is higher at the moment. The absence of a market correction, i.e., a decline of at least 10+% has confounded some investors. A chart making the rounds on the internet today is the one below. The chart resembles the trading set ups in the shaded boxes in the above chart. Further influencing investor sentiment is the trading action of stocks following their earnings announcements, like Apple's (AAPL) stock price action tonight. Apple reported earnings tonight and once trading resumed in the stock Apple's shares traded $40 higher or a gain of 8% in after hours trading. More detail needs to be gleaned from the conference call, but Howard Silverblatt of S&P Dow Jones Indices noted the stock buyback impact reduced share count by 3.4% resulting in an EPS increase for the March quarter of 15.2% versus the March 2013 quarter. Net income though only increased 7.1%. If one needed an example of a breakdown of the Efficient Market Hypothesis, this might be a good place to start. As we noted in our fourth quarter Investor Letter, we cautioned investors about looking at past returns and projecting those into the future. 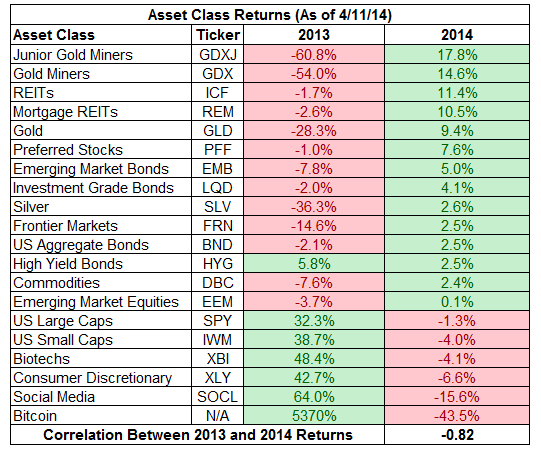 The first quarter of this year was a perfect example where returns in 2013 did not carry over into the first quarter. Our Spring 2014 Investor Letter provides commentary on the rotation that has occurred in the market during the first quarter. What makes the economic assessment more difficult at the moment is the fact this winter's weather was some of the worst in recorded history, not only in the Midwest, but across the entire U.S. The Southeast even experienced snow this winter. Below is the link to our Spring Investor Letter that provides our review of the quarter and insight in to the year ahead. For our clients and readers, we appreciate the confidence you have placed in us and always welcome your comments. Nearly four months into the trading year and the market indices have essentially traded sideways from the beginning of the year to Thursday's close. The S&P 500 Index is up .89%, the Nasdaq 100 is down 1.60% and the S&P SmallCap 600 Index is down 1.17%. On the other hand, as we noted in a post late last week, certain segments of the market have experienced significant corrections: social media and biotech, for example. One link in this week's magazine is an article written by Ben Carlson of the site, A Wealth of Common Sense. One recent article, Financial Matters, is one every investor should read as it contains an interesting list of factors investors should and should not focus on. Below is the link to articles for the coming week. Interestingly, we last highlighted the Dogs of the Dow strategy about this time last year and at that time the Dow Dogs were outperforming the overall Dow Jones Industrial Average Index. 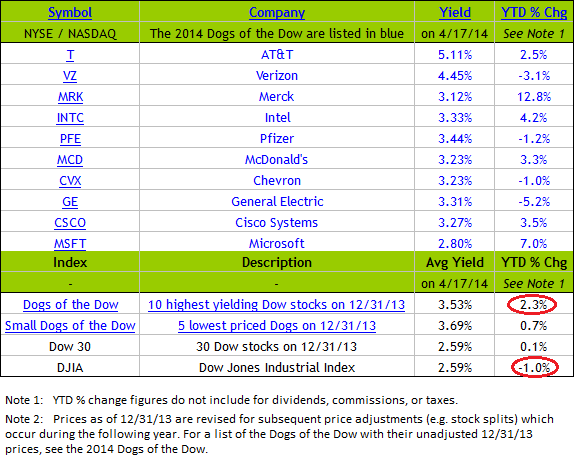 For all of 2013 the Dow Dogs of last year outperformed the Dow Index as well as the S&P 500 Index. As we turn our attention to 2014, the Dogs of the Dow are again outperforming many of the broader market indices except for the utility index and the transportation index. The Dow Dog strategy consists of selecting the ten stocks that have the highest dividend yield from the stocks in the Dow Jones Industrial Index (DJIA) after the close of business on the last trading day of the prior year. Once the ten stocks are determined, an investor would invest an equal dollar amount in each of the ten stocks and hold them for the entire year. Investors should note the strategy has generated mixed results over the years though. 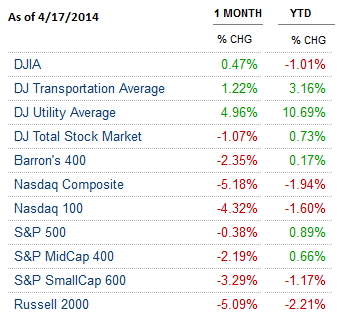 Below is the year to date performance of the Dow Dogs through the market close on 4/17/2014. Below the table is a listing of the performance of a few market indices for this year as well. The year to date outperformance of this strategy is in line with the recent rotation occurring within the market from growth style equities to value style equities. Many of the links in this week's magazine cover commentary about the recent rotation that appears to be occurring within the equity market. Additionally, several article links provide insight into important economic reports for the coming week. Lastly, earnings season for the first quarter kicks into high gear with a number of companies reporting this week and next. The link to this week's magazine is provided below. We have discussed the potentially negative investment consequences resulting from investors projecting recent outcomes into the future, recency bias. One key for investors to keep in mind is to determine if a recent result is the beginning of a longer term trend either up or down. What is difficult in this type of assessment is trends are not of equal duration. The first chart below shows small cap stocks have outperformed large cap stocks since the end of the bursting of the technology bubble in 2002 (nearly 12 years). The second chart compares the biotechnology ETF, IBB, to the S&P 500 Index. Biotechs have been outperforming the broader market since mid 2011 (almost 3 years). As we noted in yesterday's post, biotech performance has been much weaker over the course of the past several months than the broader market. 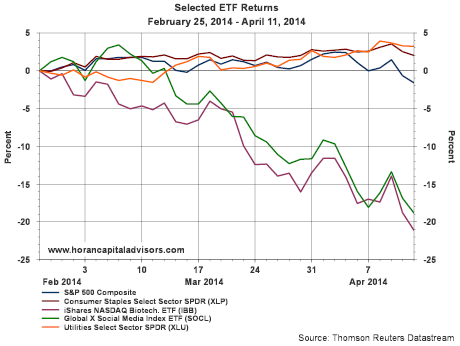 Is this the end of the biotech outperformance trend? In addition to the above market segments, small cap and biotechs, trend reversals from 2013 are also evident. In a recent comment by Charlie Bilello, CMT of Pension Partners, he compares the returns of certain market segments in 2013 versus 2014. A number of the better performing market segments in 2013 have now turned out to be the weaker ones in 2014 and vice versa. Simply chasing last years winners or jumping into a trend trade too late or even too early, can have negative consequences for the return of one's investment portfolio. Five out of the last six trading days have seen the Dow Jones Industrial Average rise or fall by more than 100 points. This type of market volatility certainly can be unsettling to investors. In addition to these 100 point plus or minus swings, is the increased commentary by some well known market strategists that are calling for a significant downturn in the market. In spite of this volatility and the rhetoric on television news shows, the S&P 500 Index is down less than 4% from its high and only down 1.8% year to date. The cause of the bearish market view is partly attributable to the correction occurring in some parts of the market. As the below chart shows, two sub-sectors of the market that have corrected significantly are the biotechnology companies (IBB) and the social media stocks (SOCL). A couple of the safehaven sectors, utilities and consumer staples, have held up well since the two momentum sectors below began to correct beginning in late February. 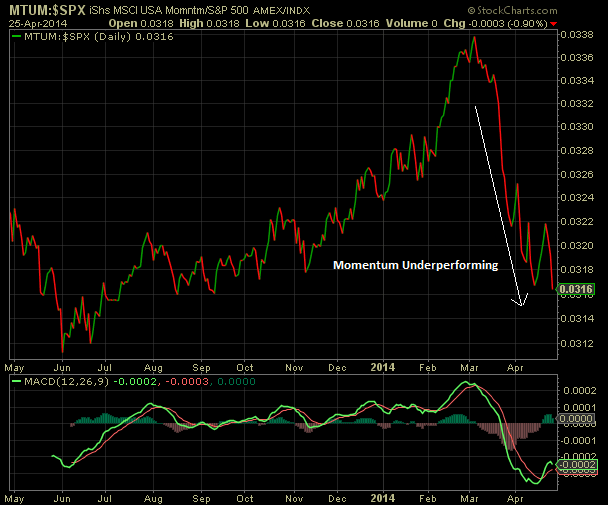 So, in reality, investors have found a reason to rotate out of the momentum sectors. From a positive perspective, this has brought the valuations of some of the momentum stocks back down to a more reasonable level. Another area of the market being impacted by this rotation is the rotation out of growth type stocks to value stocks. 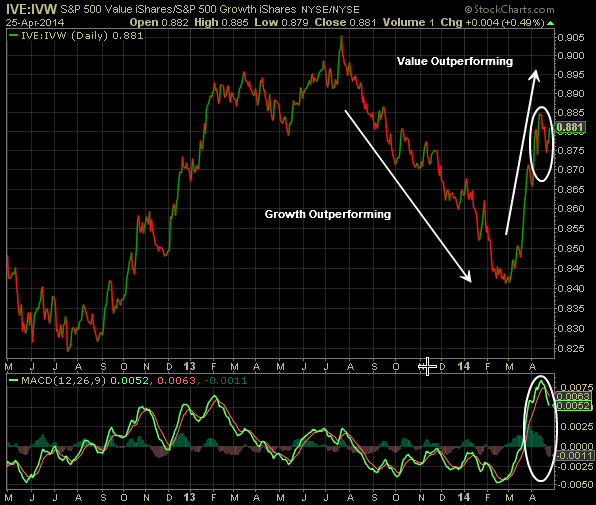 We discussed this in an article in late March, Why It Matters That Value Stocks Are Outperforming Growth Stocks. This rotation into value is continuing and is evident in the updated chart below. This type of market environment provides the bears with a platform from which they can voice their bearish market point of view. Bullish investors need to pay attention and evaluate the points raised from the bears. Importantly though, the market's direction will trend in the direction of expected future earnings growth and the anticipated growth of the economy. 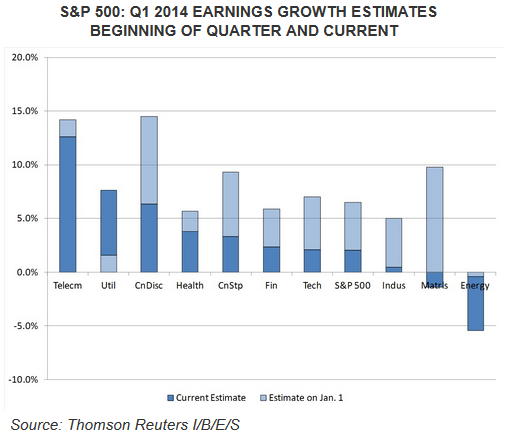 From an earnings perspective, the first quarter of 2014 is shaping up to be a weak one. 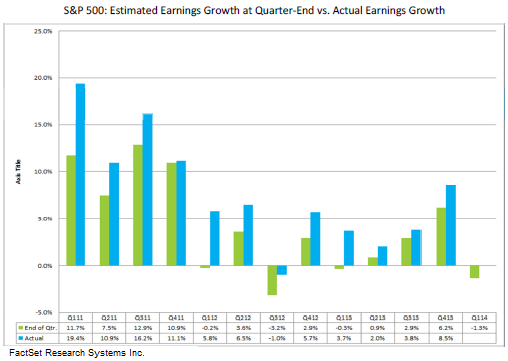 In a recent report from Factset, they note earnings are estimated to decline 1.6% in the first quarter. If this is realized, the Q1 2014 decline would be the first since earnings declined 1.0% in the third quarter of 2012 (2013 turned out to be a good one for S&P 500 stocks). The Factset report contains highlights from some companies that have implicated the harsh winter weather experienced in the first quarter as contributing meaningfully to weaker Q1 earnings. When companies miss earnings or lower guidance, they like to find a scapegoat that is something other than an internal operating issue--the weather is the scapegoat in Q1. However, we do believe the weather is a valid factor that has contributed to Q1 earnings weakness and may likely reverse itself in the last three quarters of 2014. I suppose if one always calls for a correction, they will eventually be right. And if Marc Faber is finally right that a 1987 style correction is in store for the market this year, should one sit out the market now. 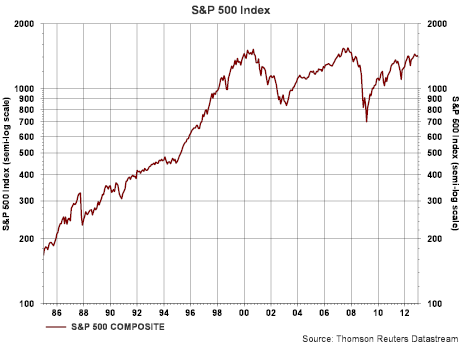 Below is a chart of the S&P 500 Index going back to 1986. The chart clearly shows the 1987 correction when the S&P fell over 57 points to 282. About a year and a half later (April, 1989), if an investor stayed invested in the market, they would have recovered entirely from the decline. How do you think about risk? Is it volatility or the probability of permanent loss? Can it be predicted and quantified a priori? What’s the best way to manage it? How reliably do you believe a disciplined process will produce the desired results? That is, how do you view the question of determinism versus randomness? Most importantly for the purposes of this memo, how will you define success, and what risks will you take to achieve it? In short, in trying to be right, are you willing to bear the inescapable risk of being wrong? The real question is whether you dare to do the things that are necessary in order to be great. Are you willing to be different, and are you willing to be wrong? In order to have a chance at great results, you have to be open to being both. This morning the American Association of Individual Investors reported individual bullish investor sentiment decline 6.9 percentage points to 28.5%. This compares to the February 6, 2014 level when bullish sentiment was reported at 27.9%. All of the decline in bullish showed up in the bearishness reading that rose 7.3% to 34.1%. The 8-week moving average of the bullishness reading declined to 36.9% and is the lowest level since this average was reported at 35.8% in mid July of 2013. For investors, this measure is a contrarian one and is most accurate at its extreme. This week's lower bullishness level is one that is approaching an extreme and in and of itself is one a positive reading for the future direction of the equity market if one is a bull. In spite of the weak finish to the market on Friday, most U.S. equity indices ended higher on the week. The Dow Jones Industrial Average and the S&P 500 Index finished the week up .5% and .4%, respectfully. The NASDAQ though declined 1.2% as many momentum related stocks experienced the brunt of the sell off. Economic data is pretty light this week with FOMC minutes being released on Wednesday, jobless claims on Thursday and PPI and consumer sentiment on Friday. One article in this week's magazine notes forward four quarter earning estimates for the S&P 500 Index are rising. Additionally, one of our articles notes the low bar that has been set for earnings in the first quarter. If earnings are accelerating and we start seeing a number of earnings beats for S&P 500 companies the market could be setting itself up for a rebound. At a recent market seminar, Ned Davis Research provided a sentiment trading chart that notes trading sentiment has moved into the extreme pessimism zone. Certainly there are seasonal hurdles to overcome as we are nearing a potentially weak market period that has occurred during mid term election cycles. Below is the link to this week's magazine. If there is one seemingly boring economic statistic that is now creating a lot of controversy it is the continuing decline in the labor force participation rate. Much of the debate around this statistic is important because it provides insight into the health of the economy and more importantly the labor market. As can be seen in the below chart, the participation rate (maroon line) is now at a level reached in 1978. I surmise if we could go back to 2007 and rewrite history so the financial crisis and resulting recession never occurred as well as no quantitative easing programs, the labor force participation rate would not be on many economists and non-economists radar. However, the angst this statistic can cause spiked last week when the Wall Street Journal reported on Friday's Employment Situation report, U.S. Reaches a Milestone on Lost Jobs. 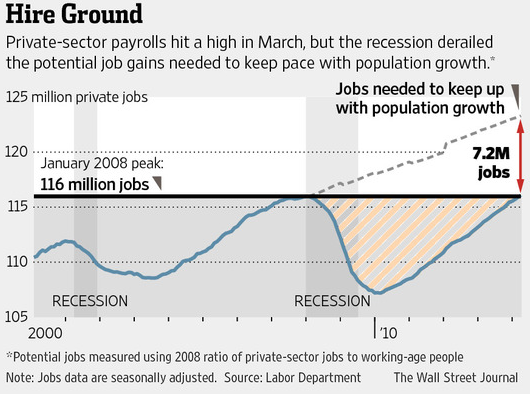 One factor in the report that stimulated some interest was the below chart that is included in the WSJ article. In a response to the article, Bill McBride author of the well written Calculated Risk website, wrote an article indicating the Journal needed to post a correction to its article. The main point made in the Calculated Risk article is the Wall Street Journal's above graph ignores the demographic impact on the participation rate. Bill's article, WSJ Employment Graph ignores Demographics, Needs Correction, provides his viewpoint on the Journal's take on the payroll report. In an article written in Investor's Business Daily, Hold The Champagne On That Job Report, this article notes the labor force has grown by 12.2 million participants. The IBD article uses the current labor force participation rate and notes, "That means just to get back to where we were when the recession started — based on a labor force participation rate of 63.2% — we have to create at least 8 million more private-sector jobs. Even if the workforce didn't grow at all, it would take us more than 3 1/2 years." James Bullard, Chief Executive Office of the Federal Reserve Bank of St. Louis, is weighing in on the participation rate decline as well. In a paper he released in the first quarter of 2014, The Rise and Fall of the Labor Force Participation in the United States, he points to the heightened interest being placed on this indicator. "Labor force participation in the United States has been a controversial subject in current macroeconomic discussions...The participation rate - a measure of the number of people actively involved in labor markets - has generally been a secondary concern in macroeconomics. However, with recent sharp declines following the financial crisis and recession of 2007-2009, it has suddenly become a salient topic, and one that gets discussed even in non-economic settings." "At its broadest level, the debate about the labor force participation rate is a debate about the nature of the U.S. economy over the 4½ years since the end of the recession in the summer of 2009. Should we characterize the economy as substantially back to normal following the very severe recession? Or, has little progress really been made, so that the economy remains far from its potential?" In the Bullard paper, he notes the steady rise in the participation rate from 1980 to 2000. Subsequent to 2000 the participation rate has mostly been on a decline. He does believe demographics has played a roll in the rise and now decline of the participation rate. From the late 1940s to mid 1960s the participation rate was fairly stable at 59.1%. Additionally, economic activity was pretty good during this period of a lower participation level. In the Bullard paper he notes several studies projecting future participation rate levels. In one such study, the participation rate is expected to decline steadily, or by 15 basis points, to the year 2022. In this study, 70% of the decline is attributable to demographic factors like baby boomer retirements. Several other studies are cited in the Bullard paper, but he is clear that further work needs to be done on this topic. Lastly, if the participation rate decline is due to demographic factors, one might expect to see changes in the number of individuals receiving social security benefits that are directly attributable to retirements. 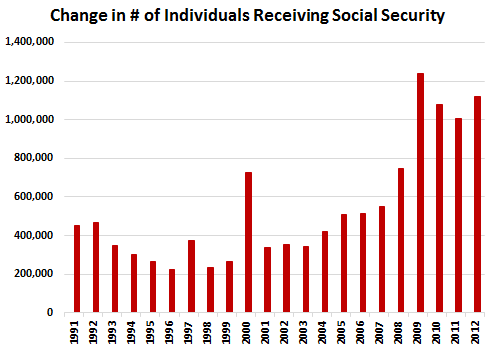 The below chart shows the annual change in individuals receiving benefit payments from social security strictly as a result of retirement. For the four years from 2009 to 2012, a net of over four million individuals joined the social security system due to retirement. The below chart is certainly on a trend that would forecast net new beneficiaries for social security in excess of one million individuals annually. Certainly, more work needs to be done in the area of participation. I believe it is fairly clear though that demographic effects are having a large impact in the declining participation rate itself. However, as the IBD article referenced above notes, the labor force has grown by 12.2 million individuals since the recession began. 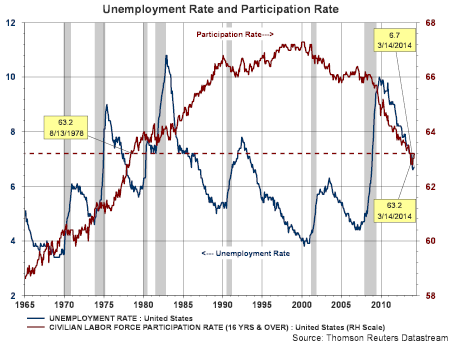 Maybe the current 63.2% participation rate is not the appropriate long run percentage, maybe it is several percentage points lower, but the economy is still not operating at full employment. The Fed is obviously looking at the unemployment rate, which continues to slowly improve, and they may be placing less weight on the participation rate. 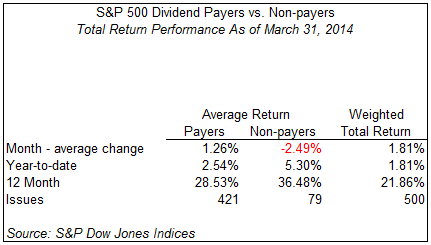 For the month of March the dividend payers in the S&P 500 Index regained their footing and outperformed the non payers by a full 3.75 percentage points. In spite of this outperformance by the payers in March, the payers return continues to significantly trail the non payers return on a year to date and 12-month basis. For investors though, is the outperformance by the dividend payers in March another sign the market is shifting to focus more on value oriented equities versus growth equities? We discussed this potential transition in a post a week and a half ago when we discussed the significance of the recent outperformance of value stocks versus growth stocks. The market's action today was certainly most negative for the momentum oriented stocks and biotech and social media sectors. On a year to date basis the utility sector has significantly outperformed the overall market as can be seen in the below chart. Utility stocks tend to be safe haven investments for investors due to their generally higher dividend yields. We would caution investors to pay attention to stock valuations (P/Es) relative to a company's earnings growth rate (PE divided by EPS growth rate) as some of these historically value oriented stocks/sectors are trading at rich valuations and high PEG ratios. In a recent report issued by Thomson Reuters' AlphaNow, it is noted analysts have lowered the bar for first quarter earnings. The only sector that saw an increase in earnings expectation for Q1 is the utility sector. The analyst revisions result in year over year first quarter earnings growth of only 2.1% versus the 6.5% in place at the beginning of the quarter. Not surprisingly, weather is being cited as the main culprit for the lowered expectations. The report concludes, "As the first-quarter earnings season gets under way, it will bear watching to see whether the negative effects of the weather outweigh the positive drivers of earnings, like consumer spending and the housing market rebound." Alcoa (AA) kicks off the official Q1 earnings season on April 8th.